Give the Mary Hramiec-Hoffman fan in your family a gift that showcases the Harbor Springs artist’s fanciful style at a stocking stuffer-sized price that’ll make you as happy as her famed polka-dot skies. 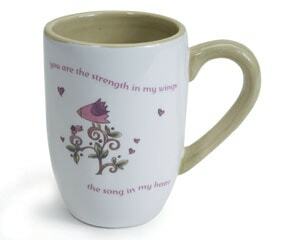 Plaques, picture frames, flower vases and mugs like the one shown here ($10.75), are all under $20. Available at Harbor Accents, Harbor Springs, 231-526-6860.